THE EASE & CONVENIENCE OF INVISALIGN – TS ORTHODONTICS BREAKS IT DOWN! Invisalign’s patented system of clear, removable aligners is a revolutionary way to straighten your teeth. As you work your way through each new set of trays, you go about your everyday activities without suffering through usual hassles of traditional braces. Patients especially appreciate Invisalign because they can continue to enjoy their favorite foods without the restrictions of the brackets and wires of regular braces. However, TS Orthodontics often hears from patients who want to know how – or if – they should eat and drink while wearing the aligners. Here are some handy tips we put together so that you can take FULL advantage of the comfort and convenience Invisalign offers. While we know that some orthodontists say that it’s okay to leave the aligners in place when you eat soft foods like mashed potatoes, TS Orthodontic recommends that you remove the aligners at every meal. While you don’t have to worry about getting food lodged in metal wires or brackets, the aligners are designed to easily slip out of your mouth. Go ahead, relish that popcorn, crunch a carrot, or bite into an apple! Removing the plastic aligners first ensures that you won’t bend or distort the precise alignment we customized just for you! While drinking with your aligners in place does not present the same concerns we have about eating with Invisalign, TS Orthodontics still advises patients to take out the aligners before downing a hot or cold drink. Darker beverages, such as coffee, tea, soda, and red wine can cause unsightly staining or discoloration to the clear plastic. In addition, a steaming hot drink may also cause the aligners to become slightly misshapen. While we always love seeing our patients, we don’t want you to have to schedule an extra appointment in our office to restore your Invisalign trays! #3) DO BRUSH & FLOSS NORMALLY – DON’T FORGET TO CLEAN YOUR ALIGNERS! 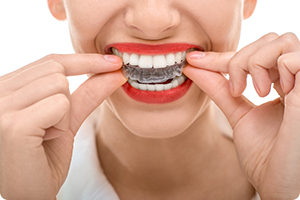 Keeping your Invisalign aligners clean couldn’t be simpler. There’s no need to purchase any additional type of cleaning solution. Just continue with your usual daily oral hygiene routine – aim to brush and floss your teeth after each meal – and also brush the aligners with your regular toothpaste, followed by rinsing. Still have questions? Give our office a call at 828.263.4514. Our friendly, helpful staff is always here for you!